Lake Oswego's Ben and Will La Fond are used to working hard, used to working together and used to working to overcome obstacles. 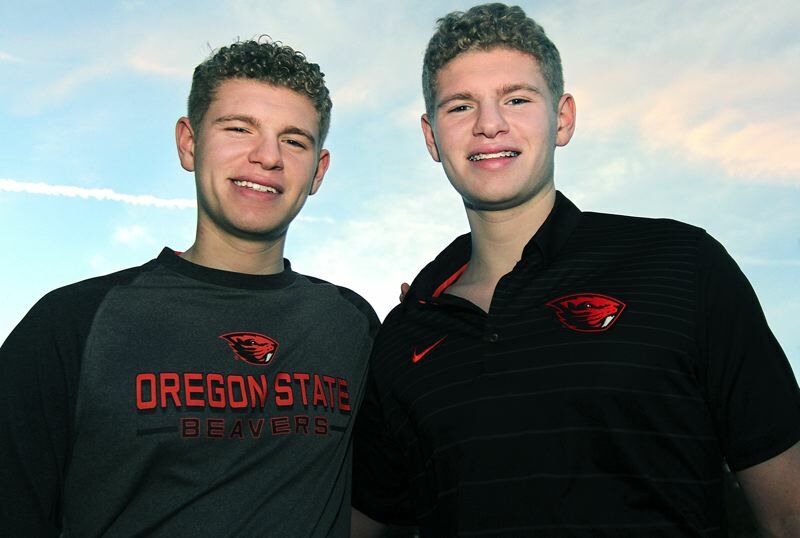 The Lake Oswego High School seniors — identical twins who are now 17 — have put those traits to good use in their athletic careers, currently with Lake Oswego Community Rowing and next year as members of the Oregon State University men's rowing team. But the La Fond brothers' characteristics — an affinity for hard work and an ability to overcome obstacles — have been useful in another part of their lives, too. Those attributes have also helped them in their lifelong battle against idiopathic anaphylaxis — life-threatening allergic reactions to peanuts, tree nuts, sesame, seafood, melon, kiwi, bee stings and penicillin. While the La Fond twins have clearly found ways to deal with their allergies — thus the shot at college athletics — it hasn't always been easy. Will recalls an episode that occurred when he was 4 years old and he ate a chocolate-covered pretzel that also had pecans on it and drank some hot chocolate during a Pittsburgh Steelers football game. That incident forced him to leave the game with his father, Christopher, and led to a four-day stay at the hospital. More recently, Ben ran into a food item — he's not sure which one caused the problem — at his aunt's house after Halloween that forced him to use his EpiPen to alleviate his symptoms. As frightening as those episodes might be for someone else — and likely still are for parents Kristin and Christopher La Fond — they're just part of life for Ben and Will. "It's been so long and I've had so many (episodes), they just kind of blend together," Will said. "I don't usually freak out about the allergies," Ben said. "It's better to be calm than to panic about it." Over the years, Kristin has had to become something of an expert in her boys' condition, as well as an advocate for their care. Back when the twins were in elementary school, she battled the school district over eliminating nuts and other allergens from Lake Grove Elementary. Now, she helps shape the boys' diets, teaches them to protect themselves and works with the administration at LOHS (as well as the boys' teachers and their coaches at LOCR) to keep them healthy and safe. While the early symptoms of the boys' allergies are always the same — facial swelling and hives — it's the more serious effects that are most concerning. "The ones we focus on are the ones that impact their airways," Kristin said. Some things, however, have gotten better. After a five-year move to Boston necessitated by Christopher's job, Ben and Will went through a trial at Boston Children's Hospital that led to new medication and a treatment regimen that, over time, has helped eliminate their allergies to eggs and wheat and lessened others. Still, Kristin — she and Christopher are also parents to Quinn, 19, and Gianna, 13 — worries about her boys. "We have been very lucky," she said, adding that "(ages) 16-25 are the high-risk years for fatalities because the kids become complacent. Hopefully, they have been educated enough to never get there." For their part, the twins have gotten so used to their allergies, so good at avoiding episodes and treating them when they can't, that their senior years at LOHS are progressing like almost anyone else's. They're focused on their school work, their friends and their rowing, and they're excited about their future in college rowing at OSU. Both are scheduled to participate in a national letter of intent signing day at Lake Oswego on Feb. 6. "(Oregon State) has always been the top pick," Ben said. "It's close to home and I really like the team spirit there." While both brothers know they have a lot of work ahead of them, they also know what they want — to win a spot in one of the Beavers' three varsity boats and help OSU earn a berth in the IRA National Championship Regatta. "We want to race in nationals," Ben said. "Competing at IRA is the top of the top. That's the goal," Will said. The La Fonds first experienced the sport when they saw their cousins, Andrew and Alex Barakat, row on the Charles River near Boston. From that moment on, the brothers knew they wanted to row, too, and began their competitive careers once they reached high school. Ben and Will — after also playing football as freshmen at LOHS — quickly came to love their sport. "It's the ultimate team sport," Will said. "There's no stars — you have to have everyone in unison together." "When you're in a boat … it's like time isn't there," Ben said. "You're literally flying on the water. When the boat hits the water, there's a serenity about it." Together, the La Fonds have participated at some of the highest levels of youth rowing, competing in the USRowing Youth Regional Challenge in Florida in September, placing second in the Portland Fall Classic in October, and taking fourth in the Head of the Lake event in Seattle in November. With all the time they spend together — at home, at school and in the boat — the La Fonds can't help but get a little competitive. "He's faster, but I've got better technique," Ben said. "And I lift more than him (in the weight room). But he's faster on the Erg machine." While Will argued with Ben's claim of being "faster," he chose to take the high road regarding his ability vs. his brother's. "We push each other to go faster," he said. "It's really in each other's best interest — best for the team. We want each other to do good and push each other and make the boat go faster." Beyond all that, Ben and Will both admit that the twin factor has played a part in their success. "We row in sync," Will said. "And connected people do better in a boat."